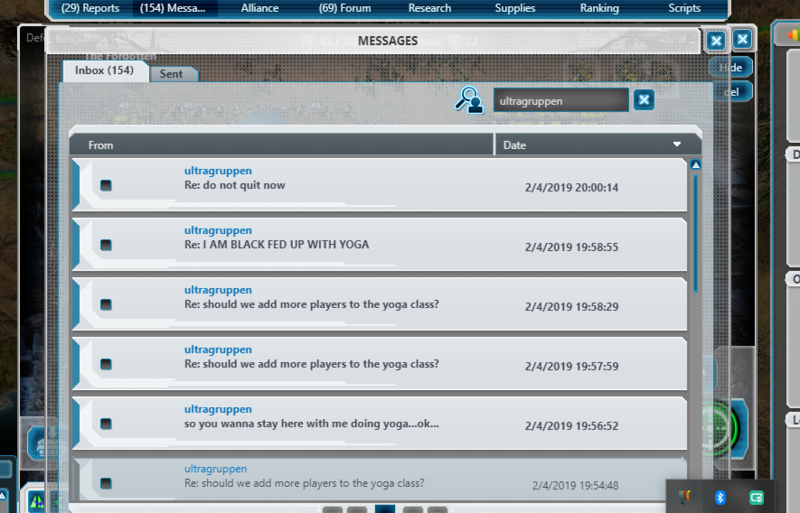 Isn't EA Admin paying attention? These spamers on 'Firestorm 11' are running amok Please don't bother them with a warning.... Just kick their accounts- they deserve it. They don't monitor individual worlds for spam, as far as I know. 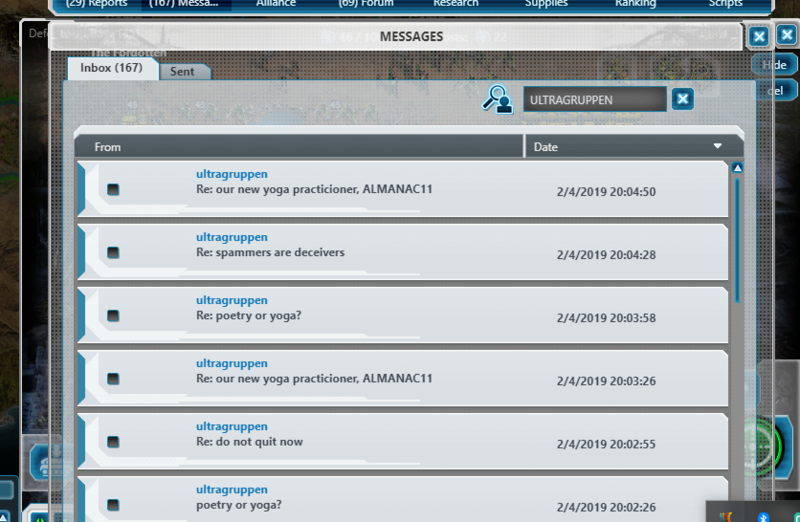 Spam messages (as opposed to alliance generated spam) should be reported via the in-game system. 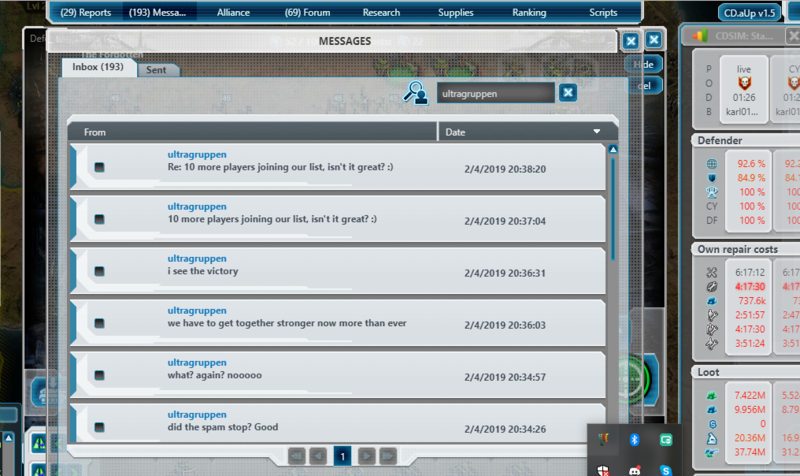 Are we talking spam in ingame chat or messages? If you have screenshot you can send them to me via PM. As far as I know it has been reported since it started a while ago now. Continues to happen on a daily basis. 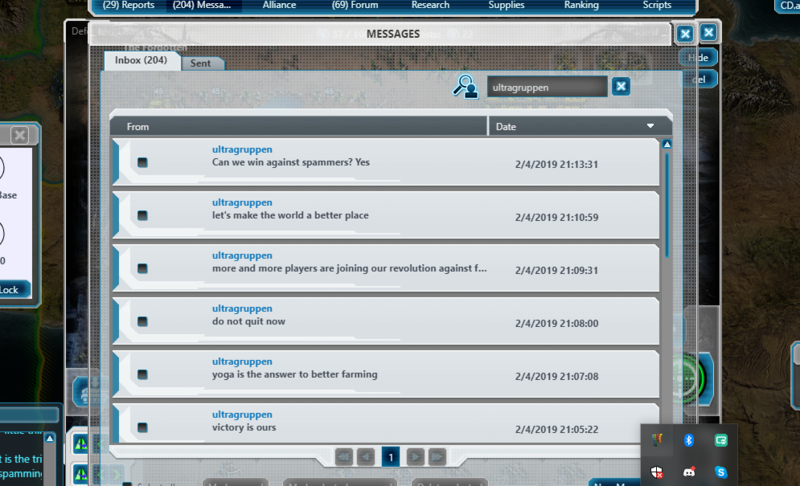 tech support - now he is in global chat warning everyone before sending out his mass spam - any chance we can see some action please? 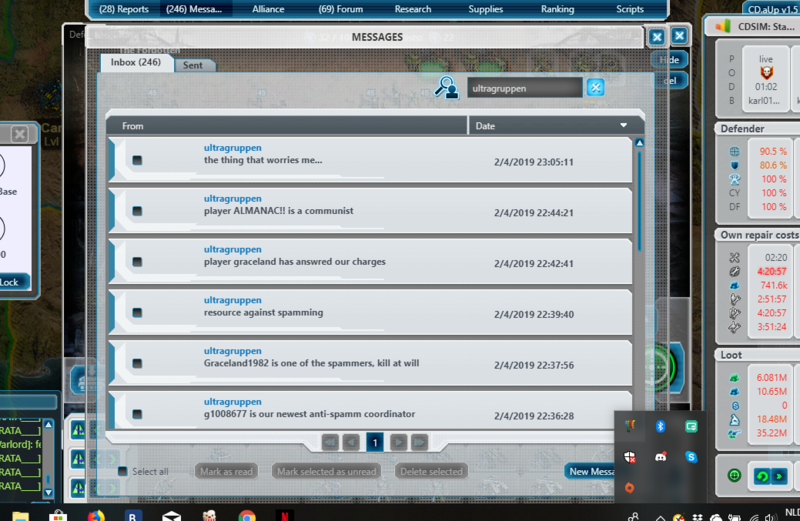 i think we are already with enough players now on firestorm11 who reported that guy.Spam keeps comming i already needed to delete arround 500 messages. Tech support does not monitor these forums minute by minute (the devs visit occasionally). Take screen shots of the messages, multiple times and save them. I note you say you can't PM - which is correct for a new account. You need more successful posts to do many things now. When you can, then send concurrent shots to @EE_Elephterion on here and he will probably respond privately tomorrow. Make sure the timestamps are clear and that they overlap from one shot to another. Also, keep any spam messages in your inbox. > Tech support does not monitor these forums minute by minute (the devs visit occasionally). Take screen shots of the messages, multiple times and save them. > I note you say you can't PM - which is correct for a new account. You need more successful posts to do many things now. When you can, then send concurrent shots to @EE_Elephterion on here and he will probably respond privately tomorrow. Make sure the timestamps are clear and that they overlap from one shot to another. Also, keep any spam messages in your inbox. 99% of the enter server on Firestorm11 have reported this player, pretty sure everyone on his round-robin list has done so, so it's not just here it has been reported - but how to escalate so something is done about it? Hs is known to have multiple accounts as well. Pretty much the only way is to report it here too. If you're not getting feedback from the report you make, that is normal. They seem to have a pretty high threshold before the EA support system will do anything, and even then it may misunderstand what is being complained about. I've known the complainant get a warning for obscene language when in fact they were quoting the offender! Keep reporting in this thread, you will reach the threshold to be able to send PM/DMs eventually. 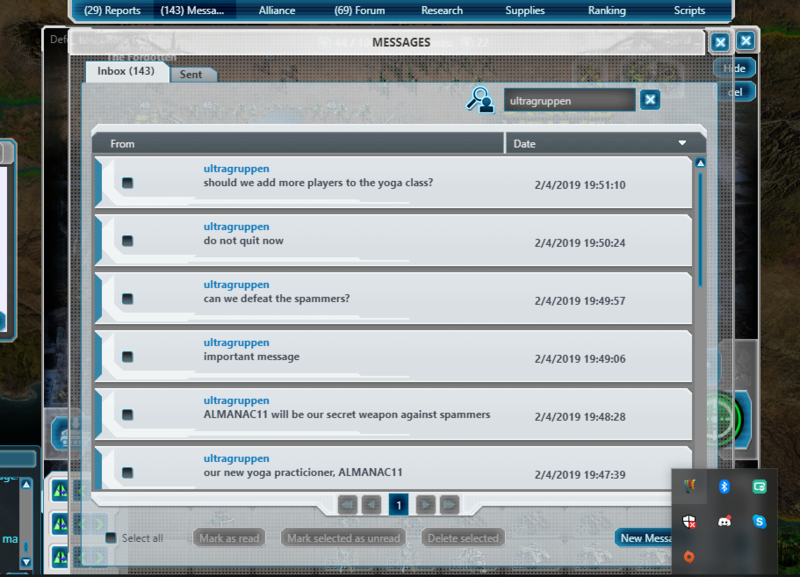 Get more of your alliance to add to the thread with evidence such as screenshots (unless it is offensive or obscene then keep that to Direct Messages as it will be blocked or banned here!